Home > Phone Transfer > How to Transfer Contacts from Old iPhone to New iPhone X/8/8 Plus? When planning to purchase a brand new smartphone, no doubt that iPhone is the best option for most consumers throughout the world today. Recently Apple released the latest iPhone X and iPhone 8/8 Plus that sparked a heated debate on its featured functions compared with the advanced generations, such as iPhone 7/7 Plus, iPhone 6S/6S Plus, iPhone SE and so forth . Nevertheless, people may find it troublesome to transfer contacts from iPhone to iPhone X or iPhone 8/8 Plus. In this article, you’ll learn 3 simple ways to transfer contacts to new iPhone. Step 1: Run the iPhone Contacts Transfer tool and get into “Phone to Phone” channel, then connect your old iPhone and new iPhone to PC via USB cables. Step 2: Click “Flip” button to make sure your old iPhone connected as “Source” phone and the new iPhone X/8/8 Plus connected as “Destination” phone. 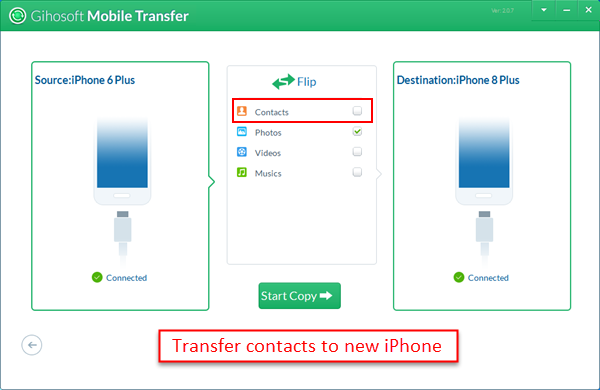 Step 3: Click contents like “Contacts” that you prefer to transfer to new iPhone, and click “Start Copy” to transfer contacts from iPhone to iPhone X/8/8 Plus. With Gihosoft Mobile Transfer software, you’re enabled to transfer more data from iPhone to iPhone, such as, transfer SMS/iMessages from iPhone to iPhone, or transfer photos from iPhone to iPhone, etc. If you don’t want to download third-party tool onto your computer, iTunes would be a better choice for you to transfer contacts from one iPhone to another. Connect your old iPhone to PC/Mac via USB and launch the latest iTunes. Click your iPhone icon on the menu bar of the iTunes, then click “info”. 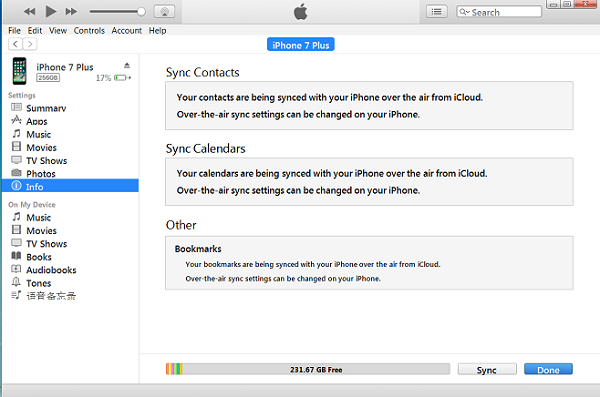 Ensure the “Sync Contacts” is selected, then click “Sync” to sync iPhone contacts. When completed, unplug your old iPhone instead plug your new iPhone. Then click your new iPhone icon on the menu bar, and click “info”. Enabled “Sync Contacts” and select the “Contacts” from the “Advanced” section. Click “Sync” to transfer contacts from iPhone to iPhone X or iPhone 8/8 Plus. The online iCloud sync service on the iPhone may spare you some complicated procedures, so you can rely on it under Wi-Fi network when you want to transfer contacts from iPhone to iPhone. However, Apple has a 5GB limit for iCloud storage, and you must pay for more. 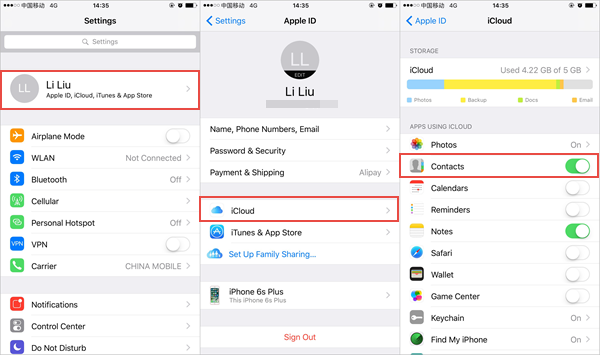 Sign in iCloud with the same Apple ID that you’re going to use in the new iPhone. When you signed in, turn on the “Contacts” and enable it to sync with iCloud. Scroll down and tap “Storage & Backup”> “OK”> “Back Up”. When the “Set up your iPhone” message appears on your screen, tap “Restore from iCloud Backup”. Enter with the same Apple ID and password as before. Once restoration finished, the iPhone will reboot.